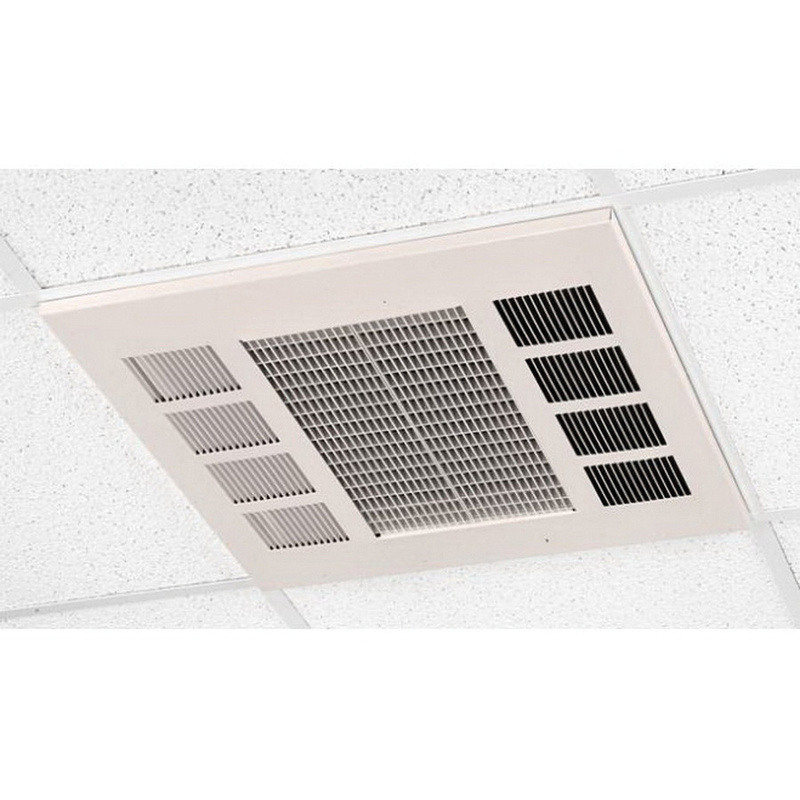 Q-Mark Commercial industrial downflow ceiling heater in northern white/navajo white color, uses steel finned totally enclosed steel sheathed nickel chromium heating element to provide heat up to 13.7/10.2/6.8 BTU/hr. It is designed to operate with an air flow rate of 300 CFM. This ceiling heater employs impedance protected and permanently lubricated motor with totally enclosed rotor. It has a voltage rating of 240-Volts, current rating of 16.7/12.5/8.3-Amps and power rating of 4/3/2-Kilo-Watts. The fan motor of this heater supports rotation at a speed of 1400 RPM. This 1-/3-Phase heater features 20 gauge steel housing with phosphatized/baked enamel painted finish. The back box serves as recessed rough-in box to facilitate recessed mounting on masonry, T-bar or frame ceiling construction, while surface mounting plate serves as rough-in box to facilitate surface mounting. It is suitable for use in bathrooms, offices, conference rooms, lobbies, waiting rooms and entrance ways. This heater has a temperature rating of 45 to 90 deg F. Heater is cULus listed.